The star’s oldest tattoo is a ‘Jesus’ inked on her left wrist which she got at the age of 18. This tattoo showcases the spiritual side of her, and since both her parents are evangelical ministers, this tattoo was a reminder for her religious upbringing. 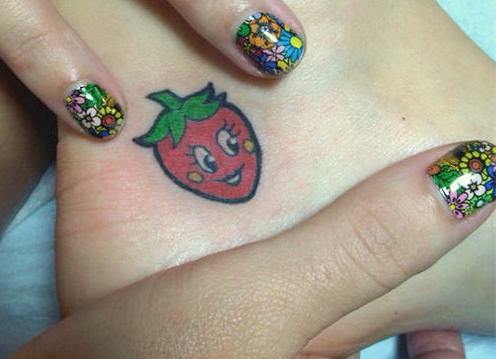 The star is known for her cute tattoos; she got a smiling strawberry tattoo on the inside of her left ankle in 2009. Katy also uses Strawberry prop in her concerts many times. Katy and her ex-fiance, Russell Brand got Sanskrit tattoo saying “Anuugacchati Pravaha” which means “Go with the Flow.” They got these matching tattoos on the inside of right biceps. This particular tattoo was significant to both of them as Russell proposed Katy in India during their Jaipur vacation and one year after that they got married in India with proper Hindu traditions. Adding to the list of cute tattoos, Katy got a smiling cartoon of peppermint candy inked on her right ankle. She said it was matching the smiling strawberry on the other ankle. Katy also said that while strawberry represented ‘One of the Boys’, peppermint tattoo represented her candy-themed, “Teenage Dream” album. 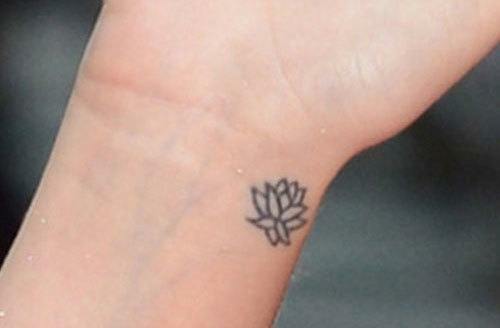 Katy Perry got an intricate outline of lotus flower tattooed on her wrist in the year 2012. Even though, Katy herself never revealed why she got that tattoo, many believed that lotus signifies the clarity phase for the star after her separation from husband Russell Brand. Katy also has a tattoo of cherry blossom on her right ankle. This particular tattoo comes from a traditional Japanese tattoo art which represents transience of life. Katy’s ex-boyfriend, John Mayer also has a similar tattoo on his wrist. Hello Kitty’s head is inked on Katy’s right middle finger. For Katy, it signifies significant birthdays of her and the cartoon kitty. While Katy’s birthday is on 25th October, Kitty’s birthday is celebrated on 1st. The tattoo was done on Hello Kitty Con celebrating the 40th anniversary of the characters. Katy once tweeted “OMG HELLO KITTY IS A SCORPIO TOO ILY!! !” showing her obsession with the cartoon. 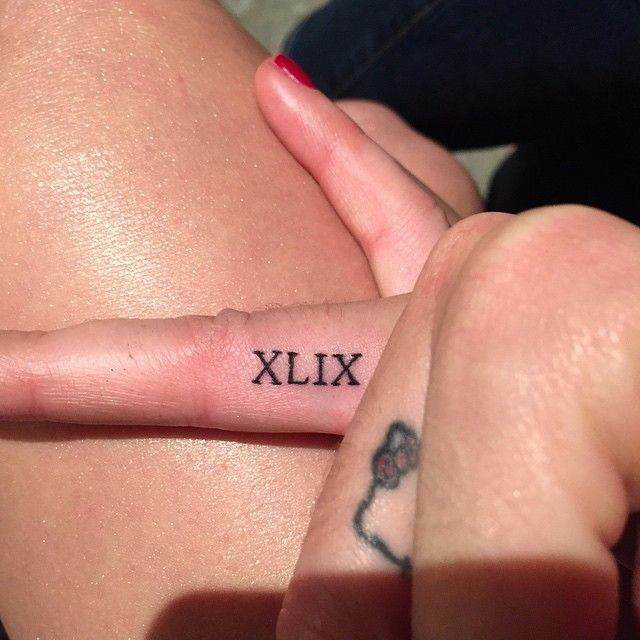 Katy has Roman numeral XLIX inked which represents number 49, following her halftime appearance at a show of Superbowl XLIV. In her performance, Katy sang the medley of her greatest hits. She got this tattoo only after few hours of the show and wanted to remember the night of celebrations forever. 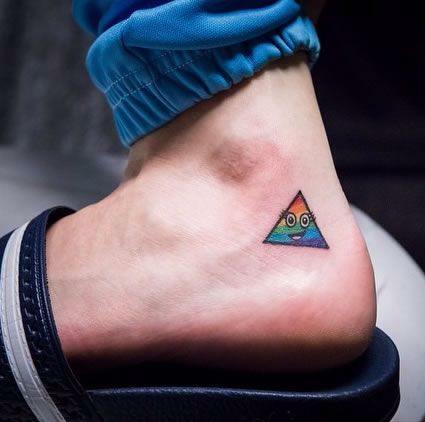 Katy recently got a colorful triangle/prism tattoo on her left ankle which has rainbow colors and features a happy and smiling face. Such a tattoo correctly defined the vibrant image of the star.